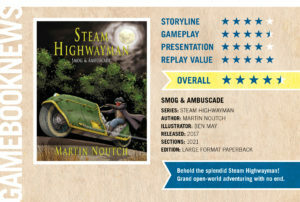 Steam Highwayman now has an interactive Audio Adventure! One of the most popular adventures within Smog and Ambuscade was the Spenser Cup, in which you must race a high-powered steam car, making tactical decisions as you ride. I’ve narrated the sections and organised them so that your choices can string the events together into one story. A different take on the ‘gamebook’ format: I’ve created the ‘gameaudiobook’.